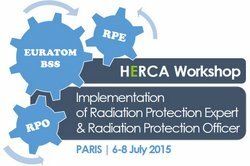 On 6-8 July 2015, HERCA (Heads of Radiation Protection Authorities) organised a workshop hosted by the French nuclear Safety Authority (ASN) in its premises in Montrouge (France) on the implementation of Radiation Protection Expert (RPE) and Radiation Protection Officer (RPO). Experts from 17 European regulatory countries participating in HERCA plus experts from international organisations such as EC, IAEA, and IRPA participated in this workshop. As part of the HERCA Action Plan in relation with the transposition and implementation of the Directive 2013/59/Euratom (Euratom BSS), this workshop was initiated by the HERCA Task Force on Education & Training in Radiation Protection. It was an excellent occasion to exchange a view with members of the ENETRAP Network to coordinate efforts on the implementation of BSS on RPE and RPO at national level. Read the full report and watch the presentations on the HERCA website.